"With over 25 years of experience in treating complex venous cases, he now dedicates his practice exclusively to the management of patients with varicose veins." Dr. Shah, a well respected vascular surgeon among his peers, led the way to bringing endovenous ablation, a new technology for the management of varicose veins, into the office and helped establish Atrium Laser Vein Center. Dr. Shah has over 25 years of experience in treating complex venous cases, and he now dedicates his practice exclusively to the management of patients with varicose veins. With the new technology it is possible to treat patients in a relaxed office atmosphere with minimal pain, discomfort and time away from work. Dr. Shah strongly believes that taking care of patients with varicose veins is more than just performing a procedure. He has vast experience in skin laser, sclerotherapy, ultrasound-guided sclerotherapy, mini phlebectomy and VNUS closure. 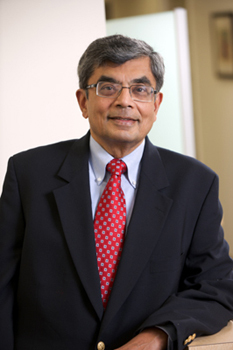 Dr. Shah is a graduate of Bombay University in India. He completed his post-graduate training in New York. Dr. Shah is a diplomate of the American Board of Surgery. He was among the first few in the country to obtain a certificate of special qualification in Vascular Surgery awarded by the American Board of Surgery. He extended his interest, commitment and excellence to the management of venous problems. He is also among the first few in the country to be a diplomate of the American Board of Phlebology. He is a fellow of the American College of Surgeons. He is also a member of regional, national, and international Vascular Surgery Societies. He has authored numerous scientific publications. He is on the faculty of New York Medical College and holds the rank of professor of surgery. He was listed in the Guide of America's Top Surgeons and in Castle and Connolly’s Top Doctors in the NY Metro Area.